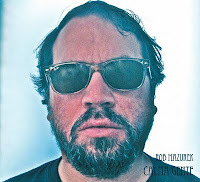 Cornettist Rob Mazurek is some kind of a musical genius. He has played everything from bop over rock to weird avant-garde, yet at the same time he managed to create several musical styles that can be called his own, and good ones at that. His new album, released on an obscure Brazilian label, country where he now resides, is again an absolute feast for the ears and mind. We find back the broad cinematic sweeping themes of the Exploding Star Orchestra, but then in a kind of musical collage, with sounds upon sounds perfectly mixed changing the background for the joyful cornet solos like a kaleidoscope, ever changing, and all that with odd meters and changing tempi. As one of the originators of the post-rock of Isotope 217 and Tortoise, we also find back these rock-based elements, yet sometimes closer to the mad rhythmic subtleties of the Penguin Café Orchestra ("Purple Sunrise"), with lots of Brazilian influences. The music is a times incredibly dense, with many instruments mixed together, but you also get the other extreme of light-textured duos or solos, including a wonderfully sweet guitar and cornet duet, that will move to tears, as its title suggests. All compositions are of the same high level, but my favorite is the long and hypnotic "The Passion Of Yang Kwei-Fe" on which Mazurek on cornet but especially Nicole Mitchell on flute elevate it into even higher areas of extreme sensitivity. The musicians include Thomas Rohrer, Nicole Mitchell, members of the Exploding Star Orchestra, Hurtmold, São Paulo Underground, Black Earth Ensemble, and Kiko Dinucci. Anyone who claims that this music is not jazz, is probably right, but then who cares. Again, Mazurek takes us along on a wonderful musical journey, full of weird sounds, industrial ambient, compelling themes, madness, lots of incredible craftmanship and emotional delivery, and a percussive delight. Below I put a short list with the links to the most recent albums by the composer. You will notice that most of them already got 5 star ratings, and you will also notice that I do not like everything he does. It's also easy to recommend his work with Isotope 217 and Tortoise, but also the excellent EP "Lila" by HIM is worth a listen. Buy from Submarine Records. The original album was badly produced, with two seconds of silence in between the tracks, so it was recalled, and the problem is solved. The new issue brings the music as it should be heard in one long suite-like composition. Is there a place where the personnel involved in this record is listed? That's indeed where you have to buy it from. It's a pity you can only buy from Submarine Records in Brazil as you cannot pay by PayPal or a credit card. Instead you have to purchase by bank transfer the extra cost of which is,for me,prohibitive. Send them (Rob M) an email to explain the problem. Often people don't realise what's happening if nobody points out the credit card/paypal etc difficulty. I'm sure there will be other ways to purchase the CD. Eventually, I took a chance and just sent cash to Submarine Records in Brazil. Angela Novaes was very, very helpful and quickly sent the CD to the UK. It really is, as Maxime says, a simply beautiful recording -- well worth the extra effort. Anyone who wants to purchase this CD can email me at banquinha@noropolis.net. FYI, Rob lives in the greater Chicago area now, and has for some time. He tends to travel to/work from Brazil at least once a year now, maintaining the relationships that he built while he lived there. This is a beautiful album. It's a shame it's so hard to find.